To find other places to visit, maps, more things to do, and tourist information, go to the Mudgee trip itinerary maker site . Sutherland to Mudgee is an approximately 4-hour car ride. Plan for slightly colder temperatures traveling from Sutherland in May, with highs in Mudgee at 21°C and lows at 5°C. You'll set off for Narrabri on the 7th (Tue). Narrabri is a town and seat of Narrabri Shire local government area in the North West Slopes, New South Wales, Australia on the Namoi River, 521km northwest of Sydney. Step off the beaten path and head to Pilliga National Park and Bank Art Museum Moree. Visiting Narrabri Fish Farm and Waa Gorge will get you outdoors. Go for a jaunt from Narrabri to Coonabarabran to see Dandry Gorge about 1h 45 min away. Next up on the itinerary: enjoy some friendly competition at Narrabri Bowling Club. You can plan Narrabri trip in no time by asking Inspirock to help create your itinerary. Drive from Mudgee to Narrabri in 3.5 hours. Plan for somewhat warmer temperatures traveling from Mudgee in May, with highs in Narrabri at 26°C and lows at 10°C. Finish your sightseeing early on the 11th (Sat) to allow enough time to travel to Lightning Ridge. Lightning Ridge is a town in north-western New South Wales, Australia, in Walgett Shire, near the southern border of Queensland, about six kilometres east of the Castlereagh Highway, and is served in commercial activities by the town of Walgett, some 75 km to the south. Your day-by-day itinerary now includes The Black Queen. Get outdoors at Grawin Opal Miners Sports and Recreation Club Ltd and Artesian Baths. Deepen your sense of the past at sights like Amigos Castle and 3 mile Heritage opal mines. When in Lightning Ridge, make a side trip to see One Ton Post in Mungindi, approximately 2 hours away. There's much more to do: admire the natural beauty at Bevans Cactus Nursery, browse the exhibits of Chambers of The Black Hand, get the lay of the land with Walking tours, and learn more about the world around you at Australian Opal Centre. To see traveler tips, where to stay, other places to visit, and other tourist information, refer to the Lightning Ridge trip itinerary builder website . Traveling by car from Narrabri to Lightning Ridge takes 3 hours. On the 18th (Sat), you'll travel to Roma. Roma is a town, locality and the administrative centre in the Maranoa Region, Queensland, Australia. Offical Royal Hotel has been added to your itinerary. Step off the beaten path and head to St Paul's Anglican Church Roma and Roma's Biggest Bottle Tree. Roma War Memorial Heroes Avenue and Romavilla Winery are good opportunities to explore the local culture. Take a break from Roma with a short trip to Calico Cottage Crafts in Wallumbilla, about 58 minutes away. Next up on the itinerary: make a trip to The Big Rig. To find photos, ratings, reviews, and more tourist information, read our Roma travel route planner . Traveling by car from Lightning Ridge to Roma takes 5 hours. Alternatively, you can fly. On the 21st (Tue), wrap the sightseeing up by early afternoon so you can travel to Alexandra Headland. Alexandra Headland is a suburb of the Sunshine Coast Region, Queensland, Australia, located in the Maroochydore urban centre between Maroochydore CBD and Mooloolaba.The suburb consists of several restaurants, a bowling alley, resorts and the shortest beach in the Maroochy district. You've now added 10 Toes Brewery to your itinerary. Visiting Mapleton Falls National Park and Headland Golf Club will get you outdoors. Eschew the tourist crowds and head to Coolum Beach and Spas. When in Alexandra Headland, make a side trip to see Chenrezig Institute in Eudlo, approximately 32 minutes away. For where to stay, traveler tips, maps, and more tourist information, read our Alexandra Headland day trip planning website . Explore your travel options from Roma to Alexandra Headland with the Route module. In May, plan for daily highs up to 27°C, and evening lows to 15°C. Finish up your sightseeing early on the 24th (Fri) so you can travel to Byron Bay. Kick off your visit on the 24th (Fri): get great views at Pat Morton Lookout and then enjoy the sea views from Fingal Head Lighthouse. Keep things going the next day: brush up on your military savvy at Ballina Naval & Maritime Museum, then take some stellar pictures from Broken Head Nature Reserve, then enjoy the sand and surf at Wategos Beach, and finally stop by Byron Bay Cookies Retail Store. Start your trip to Byron Bay by creating a personalized itinerary on Inspirock. Traveling by car from Alexandra Headland to Byron Bay takes 3 hours. In May, plan for daily highs up to 27°C, and evening lows to 12°C. Finish your sightseeing early on the 26th (Sun) to allow enough time to travel to Grafton. The city of Grafton is the seat of Local Government, the Federal and State Government administrative centre, and the commercial hub of the Clarence River Valley. Kick off your visit on the 26th (Sun): take in the exciting artwork at Coldstream Gallery, take some stellar pictures from Maclean Lookout, then take in the architecture and atmosphere at Christ Church Cathedral, and finally don't miss a visit to Schaeffer House Museum. Here are some ideas for day two: enjoy the sand and surf at Iluka, then take an in-depth tour of Maclean District Historical Society Incorporated, and then take in the exciting artwork at Witzig Gallery. To find reviews, other places to visit, ratings, and other tourist information, go to the Grafton online trip builder . Getting from Byron Bay to Grafton by car takes about 2.5 hours. In May, daytime highs in Grafton are 26°C, while nighttime lows are 11°C. Wrap up your sightseeing on the 28th (Tue) to allow time to travel to Crescent Head. Crescent Head is a beach-side community 440 km north-northeast of Sydney, in Kempsey Shire, New South Wales, Australia. Start off your visit on the 28th (Tue): get engrossed in the history at Macley River Historical Museum, then examine the collection at Maritime Museum South West Rocks, and then contemplate the long history of German Monument. Get ready for a full day of sightseeing on the 29th (Wed): explore the striking landscape of Arakoon National Park. To find other places to visit and more tourist information, go to the Crescent Head trip planning website . Traveling by car from Grafton to Crescent Head takes 2.5 hours. Expect a bit cooler weather when traveling from Grafton in May: highs in Crescent Head hover around 16°C, while lows dip to 13°C. On the 30th (Thu), you'll have the morning to explore before heading off to The Entrance. Kick off your visit on the 30th (Thu): browse the collection at Erina Library. 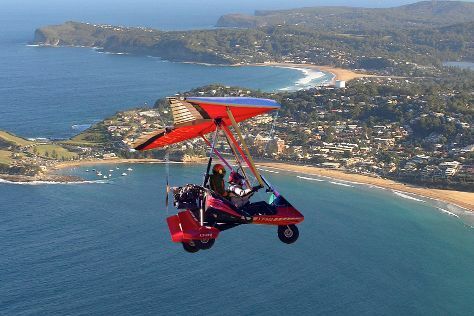 On the 31st (Fri), you'll have a packed day of sightseeing: have some family-friendly fun at Microlight Adventures, then kick back and relax at Whale Beach, and then appreciate the extensive heritage of The Entrance Heritage Walk. For where to stay, maps, traveler tips, and tourist information, read our The Entrance trip planner . You can drive from Crescent Head to The Entrance in 4 hours. Expect somewhat warmer weather when traveling from Crescent Head in May: highs in The Entrance hover around 24°C, while lows dip to 11°C. Finish your sightseeing early on the 1st (Sat) so you can travel back home.